We were charged to transform a bland and beige three bedroom apartment, which overlooks Madison Square Park, into an open and bold space. The two thousand, five hundred square foot apartment needed a major redesign of the kitchen and bath, as well as, major updating of colors and materials throughout. The existing materials consisted of tan stone and colored glass tile. The other rooms needed a bit of spatial reconfiguration and a strong color palette. We worked with the interior designer, Ryan Korban, to transform the space into a sophisticated, richly appointed apartment that fit its surrounding in the city. The apartment is sited directly on Madison Park in New York City and has the unique benefit of straddling the urbane, the Flatiron District, and pastoral, in the park itself. To look out of the dining and living rooms windows allow views of the 6-acre Madison Park. The space needed to be open and allowing one to see historic New York - the Flatiron Building (1902) by Daniel Burnham, Metropolitan Life Insurance Company Tower (1911) by Napoleon LeBrun, and New York Life Insurance Building (1926) by Cass Gilbert. These buildings frame the city’s rich architectural history and before our renovation the apartment was more compartmentalized which restricted access to the views. We worked with a rich material palette to give a unique character to the spaces. 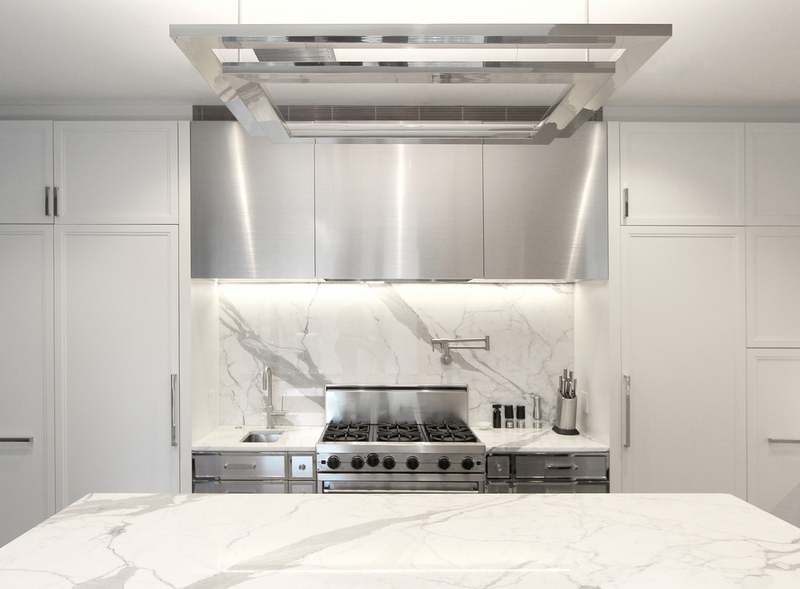 Beautifully veined calacatta marble, mirror polished stainless steel, and a warm rich black ebonized floor. The stone island in the kitchen is a centerpiece in which the family gathers around for many meals and casual conversations.The space becomes more formal in the the living and dining rooms but allows feels connected since the black herringbone floor runs throughout the spaces. On one of the living room is a suede covered book and television wall. The warm gray suede gives a the room a soft feel allowing the surface to have some interest and depth. The faux firebox is finished in a dark gray mirror. The other gray walls are finished with Farrow and Ball paint and have a corniced molding with a restrained classic profile in black. The apartment is a fitting city residence that balances the urban setting with a relaxing, comfortable space to host friends, display art, and enjoy family.